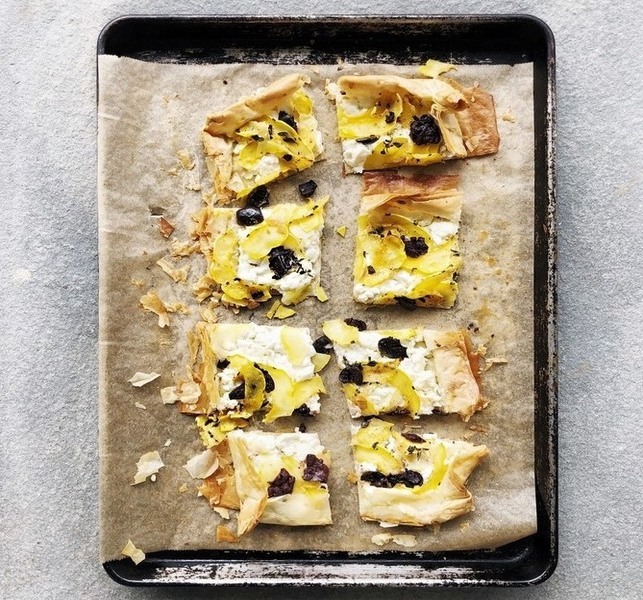 Whip up this easy tart by topping our flaky phyllo dough sheets with feta, delicata squash, kalamata olives and herbs. Recipe by Jodi Moreno of What’s Cooking Good Looking? blog. Thaw one roll of phyllo, following thawing instructions on package. Preheat oven to 375°F. To assemble the crust, prepare a parchment lined baking sheet. Gently unroll the phyllo dough onto the parchment, and cover phyllo sheets with plastic wrap, then a slightly damp towel to prevent them drying out. Have another baking sheet nearby (this will be to cook the tart). 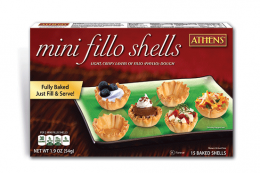 Place a piece of phyllo onto that baking sheet and brush with olive oil. Continue this process laying one on top of the other, until 9 sheets have been brushed with the oil. Do not brush the final 10th sheet with the oil. Toss the delicata with the 2 tablespoons of olive oil and the lemon juice and set aside. Spread the feta cheese from the middle out, leaving a 2″ border around the edges. Then layer the olives, and then the squash, and lastly the oregano. Season with salt and pepper. Bake for 12-15 minutes, until the edges are golden brown and the cheese is melted. Cut into squares and serve warm. 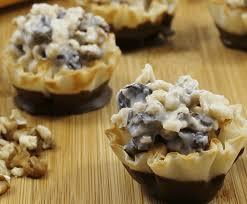 These Chocolate, Cherry, & Pecan Phyllo Crunchies dessert tarts will leave your guests’ mouths watering for more. This recipe calls for a 1/2 cup of Merlot, but it’s an unwritten rule that another 1/2 cup should go in your glass.